Introducing the Easy Peasy Wonderland Blocks pattern. Reene has designed these blocks to be very quick and effective for a single project or used in multiples to create a stunning quilt. There is no foundation piecing and all the blocks are designed to be chain pieced to speed things up when making multiple blocks. 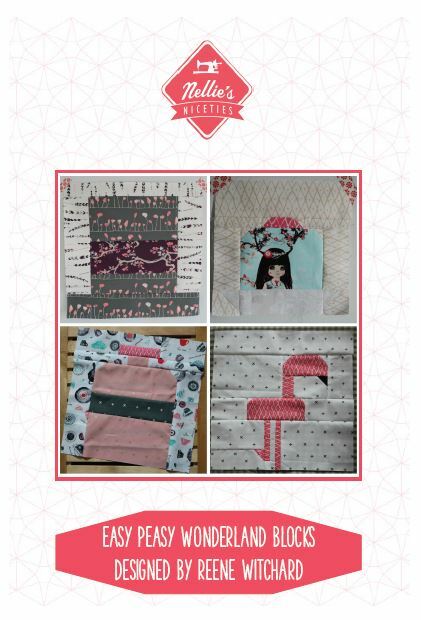 The Easy Peasy Wonderland Blocks pattern is made up of 4 simple blocks: Eat Me, Drink Me, Flamingo and Top Hat. The Eat Me and Drink Me blocks come in two sizes 6" and 12" while the Flamingo and Top Hat blocks are 12" blocks. The 18 page PDF pattern is in pictorial format so there is very little written instruction, as such it is suitable for people with at least a basic knowledge of patchwork techniques. Our pattern testers have all enjoyed the pictorial format and have found it very straight-forward to follow, we hope that you will agree. We have included colouring sheets for each block so you can test out your colour placement before cutting into your precious fabric. We've also included a suggested layout of blocks for a stunning 48" square lap quilt. If you don't have time for a full quilt you can use any of the individual blocks as the starting point for smaller projects e.g cushion cover, table runner. Simply refer to the individual block construction diagrams for cutting instructions and you're good to go.